If you find yourself sniffing or sneezing constantly but you're pretty sure you're not suffering from a seasonal cold, it could be signs of an allergic reaction to mold and you may need to learn how to get rid of mold in your home. Most people encounter some degree of mold problem in their homes at some point. 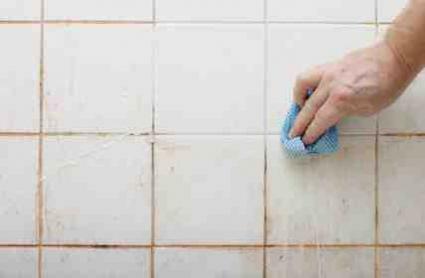 Not everyone exhibits allergic reactions to mold, but just the sight of its growth in your bathroom tiles can be almost traumatic. Fortunately, mold can easily be controlled and you can learn how to get rid of mold for a cleaner home. Repair water leaks in the basement, roof, or wall. Caulk locations such as your shower area where moisture can get trapped in floors or walls. Seal the slab in the basement with a tough concrete sealer. Do not rely on paint to stop mold growth. It is just a temporary solution. Some household items can also be used to remove existing mold. For example, chlorine bleach is a great mold killer. Combine one part of chlorine bleach with four parts of water and apply the cleaner wherever you see mold. Remember, though, that chlorine bleach should not be used on surfaces on which you prepare food unless you can thoroughly clean all traces of bleach from the area. You can also add detergent for a more multi-purpose cleaner to eliminate dirt and dust as well. For a stronger, more effective anti-mold treatment, use a fungicide cleaner. Wipe the interiors of your refrigerator with it, including the coils, gaskets, and tray. To clean carpets that are affected by mold, dust some baking soda on the surface and let it sit for a few hours. Vacuum it up afterwards for a clean carpet. Be careful while cleaning. Remember, you should wear protective gear when dealing with mold. Exposure to mold spores can cause breathing and other respiratory problems. For a more natural approach, especially in areas where you prepare food or where kids or pets go, you can also use vinegar as a mold killer. Simply spray vinegar in all locations where mold growth is apparent. This includes areas in your home such as shower curtains, faucets, tiles, and linoleum edges. You can even mop your floors with vinegar. Clothes can be affected by mold. If this occurs, to remove mold and mildew from your clothes, you can use chlorine bleach (use only for bleach-safe clothing). Mix two tablespoons of the bleach with a quart of water. Soak the stained clothing in the solution for five to 15 minutes. Rinse the clothing thoroughly to remove bleach. You can then rinse the clothes with a few tablespoons of vinegar to completely remove the bleach. Do not bleach wool or silk clothing. Lemon juice and salt is another option for getting mold off clothing. Moisten the mold stain with fresh lemon juice then sprinkle some table salt over it. Leave your garments out in the sun to dry then rinse them with water. Allow them to sit under the sun to completely dry. Do not dry the affected clothing in the dryer. It will only set the mold stains. To remove mold from leather clothing or shoes, simply wipe the area with a cloth dampened with water and rubbing alcohol (one part rubbing alcohol to one part water). To control mold in your home, you need to regulate the humidity. Warm air will hold more moisture than cold air. Using air conditioning systems will help remove the moisture and promote the circulation of cool, dry air back into your home. Increased air movement through an electric fan is also a great way of reducing the air's moisture. You can also reduce the humidity inside your home by using a dehumidifier or specialized products. For example, a product called DampRid functions to remove the excess moisture from the air and also prevents the growth of mold, mildew, and those musty odors. Mold Prevention Tip: Do not store cloth, wood, paper, and other porous materials in the foundation or basement area of your home. If you are really concerned about getting rid of mold in your home, or if you are having reactions to the mold, you need to find out what types of mold you have. You can purchase test kits at hardware stores, home centers, pharmacies, grocery stores, or online. Collect samples of the mold and place them on the Petri dishes that are included in the kit. Mail your samples to a lab for analysis. They will identify the type of mold and its exact count. Always wear a face mask and rubber gloves when touching anything with mold, especially black mold. Solving mold problems can be a time consuming process. Try to prevent the formation of mold as much as possible, and if you do identify a problem, take care of it quickly before the mold spreads. If you believe that you or someone in your family has been affected by mold spores, you should consult a physician as soon as possible.